Posted February 14, 2018 by admin & filed under Bad Breath, Diseases and Treatments, Family Dental Care, General Dentistry, Teeth Care. Today is Valentine’s Day, and you know what that means – at some point you’re going to be kissing your sweetie. And let’s be honest – kissing can be complicated. The mood, the timing, the lighting, the angle; everything needs to be just right for you to have a memorable kiss. But do you know what’s the MOST important part of that kiss? Your breath. If your breath is clean, fresh and even a little minty, that kiss will be memorable. But if your breath stinks like last night’s garlic bread, it will also be memorable – but for all the wrong reasons. Bad breath can be caused by a wide variety of factors. Poor oral hygiene, gum disease, dry mouth, tobacco and dehydration can all lead to bad breath. In addition, some medical conditions (including sinus infections and diabetes) and even foods like garlic, onions and peppers can cause bad breath. But to fight standard bad breath, the solution can be rather simple. All you need to do is maintain your oral health. And to do this, you need to make use of your toothbrush, dental floss and a mouth rinse. Brushing your teeth with fluoridated toothpaste is important because it removes plaque from your teeth and gums. (Watch my video to learn the correct way to brush your teeth). Plaque is caused by bacteria, and can definitely contribute to bad breath. 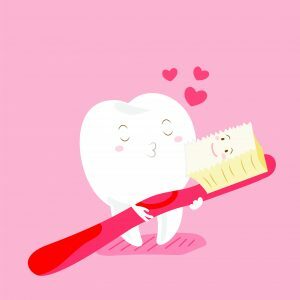 In addition, to maximize the impact of your brushing, be sure to brush your tongue, especially the back areas – it can make a big difference in how clean your mouth feels and smells. And if you REALLY want to ensure that your breath is kissable, I recommend you use a mouth-rinse to give your breath an extra bit of freshness. I usually recommend something like ACT. The fluoride will help keep your teeth healthy, while the rinse kills the remaining bacteria that brushing and flossing couldn’t get, and with a minty smell, it will ensure that your kiss can last as long as you want it to. Also, if you don’t have a chance to brush before you kiss, be sure to bring along some sugar-free gum with Xylitol, and take it a few minutes before that smooch. So, for kissable breath, all you really need to do is what you should already be doing — taking good care of your mouth. Without having to worry about white teeth and fresh breath, you can address all the other things needed to make that kiss a memorable one. For more dental information, be sure to visit me or my staff at one of the three locations shown below, go to my website at ModernFamilyDentalCare.com, visit my Facebook Page or watch my Dental Minute video, How To Treat Bad Breath on YouTube.